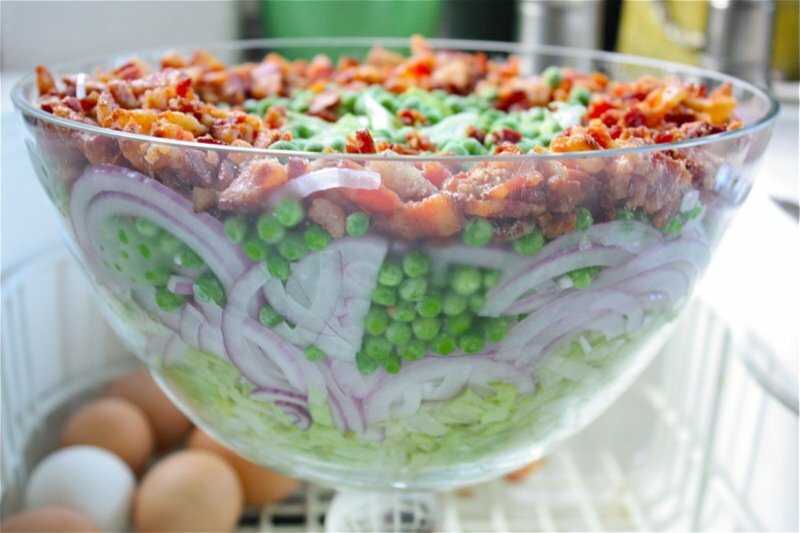 Remember the 7 Layer Salad? You will if you are “older” and a prairie child. Anyone else recall it? 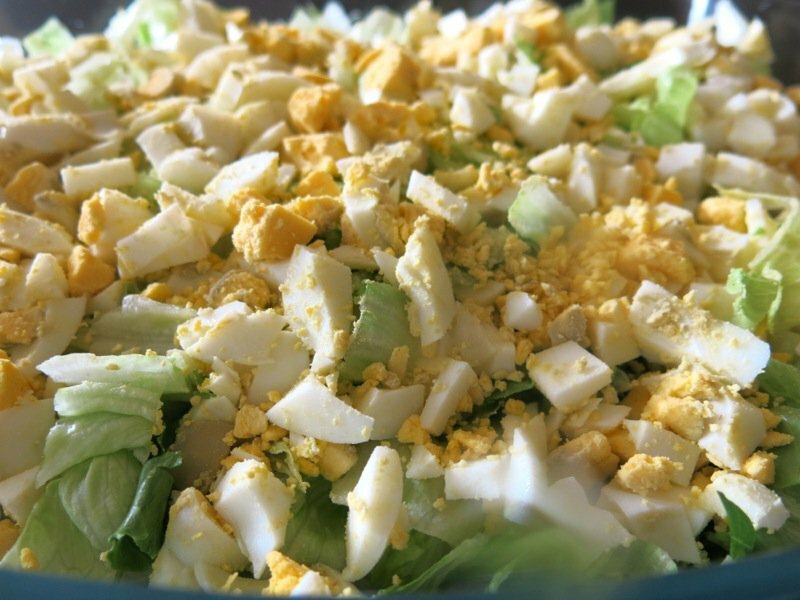 This is a salad that has been around the block and back, yet has held its own through time. She’s certainly not that gorgeous to look at, unless made in a large pedestal bowl. Now, that is a stunning presentation. 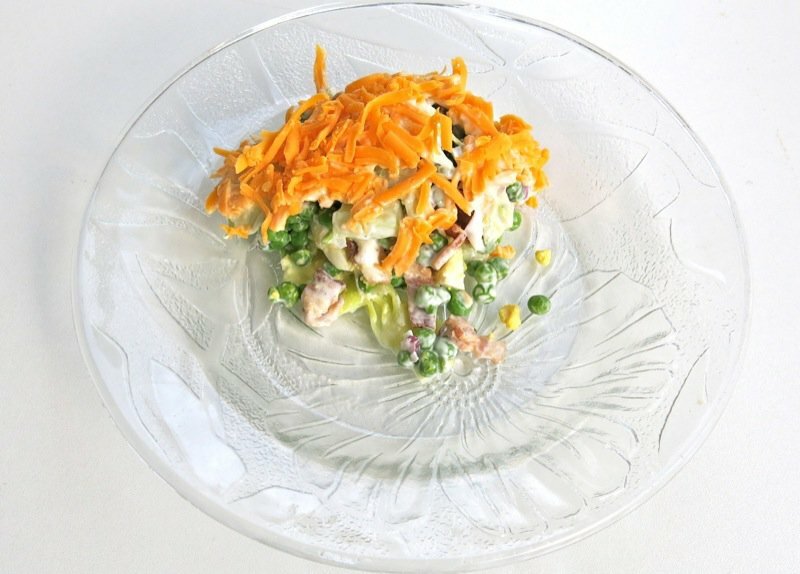 But, to serve, the salad needs to be tossed and returned to the cleaned pedestal bowl: it is just too deep to access all layers in one fell swoop. And accessing all layers is key to this baby. But, that is not all. She gets all dressed up and ready to go out 24 hours ahead of time and is best served 24 hours later: no earlier and no later. Her greatest asset is also her downfall. She isn’t that great left over the next day. Presentable, but barely. And the day after, not at all. But, that is why she has the staying power she has. 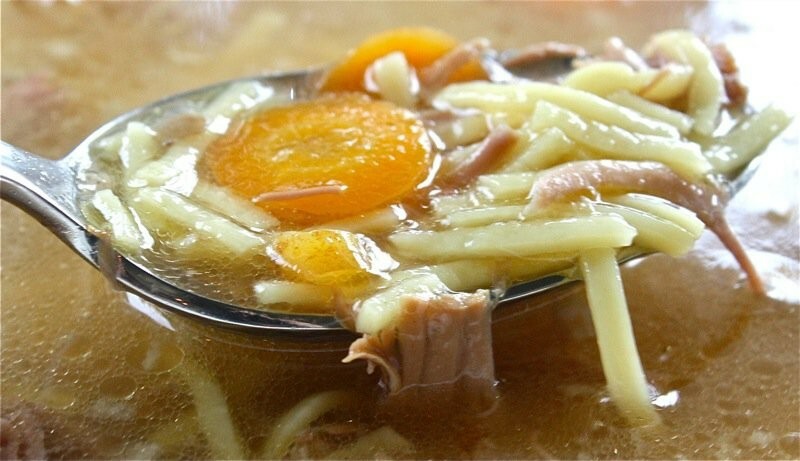 The perfect dish for a crowd. Make ahead. Extremely substantial. Served, she is as fresh and crunchy as if made only moments ago. 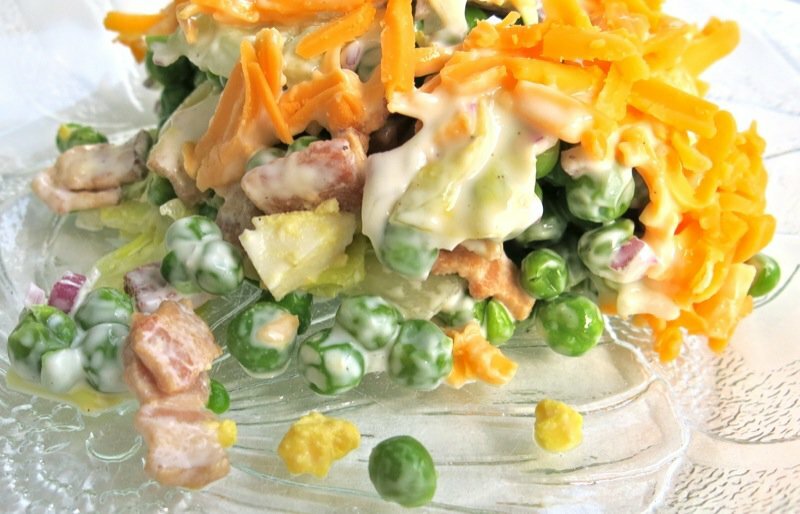 And this salad has breadth and flavour. Lots of both. The serving above is a hearty lunch. Calories? Oh, don’t go there. 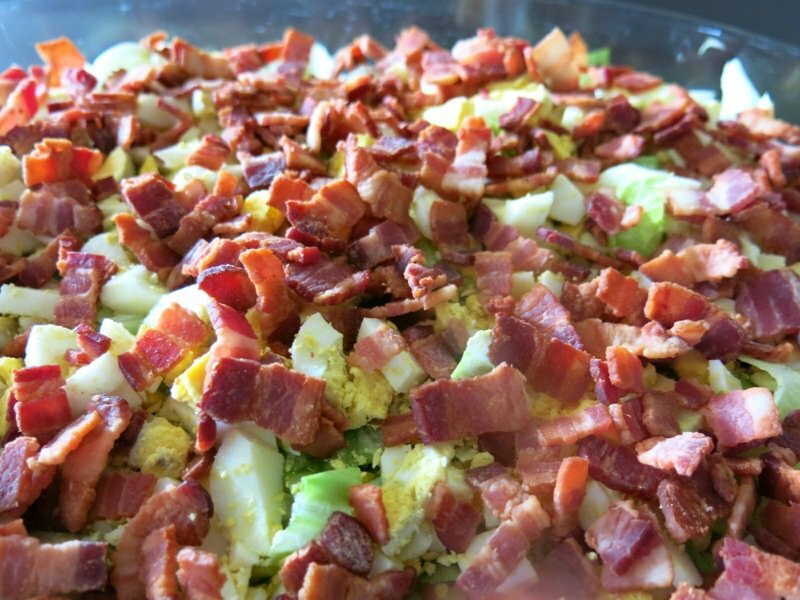 This is not a “diet” salad, but it is certainly healthy enough. 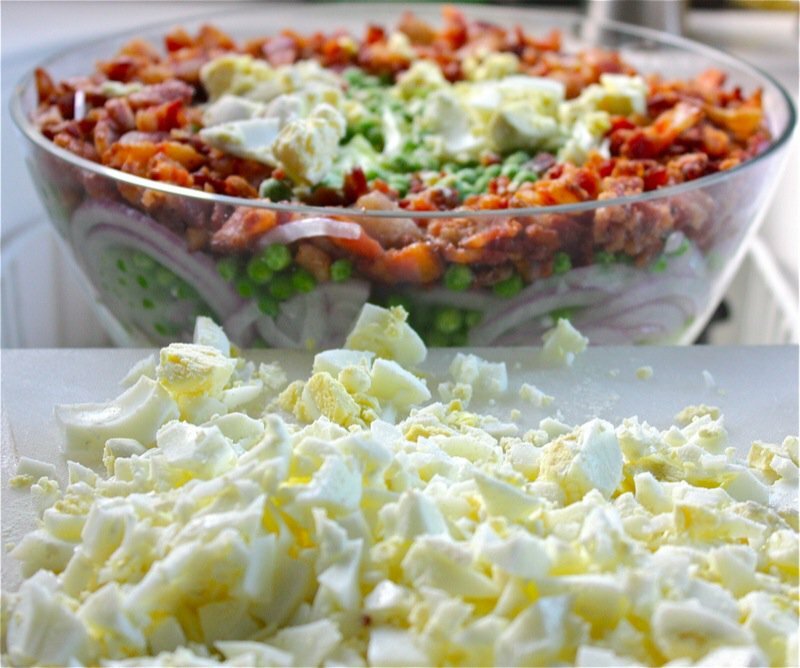 Every item in it is a real food: Lettuce, peas, onions, hard boiled eggs, bacon, mayo and cheese. The last three ingredients raise the eyebrow, but keep calm. There is only a small amount of each, per serving. 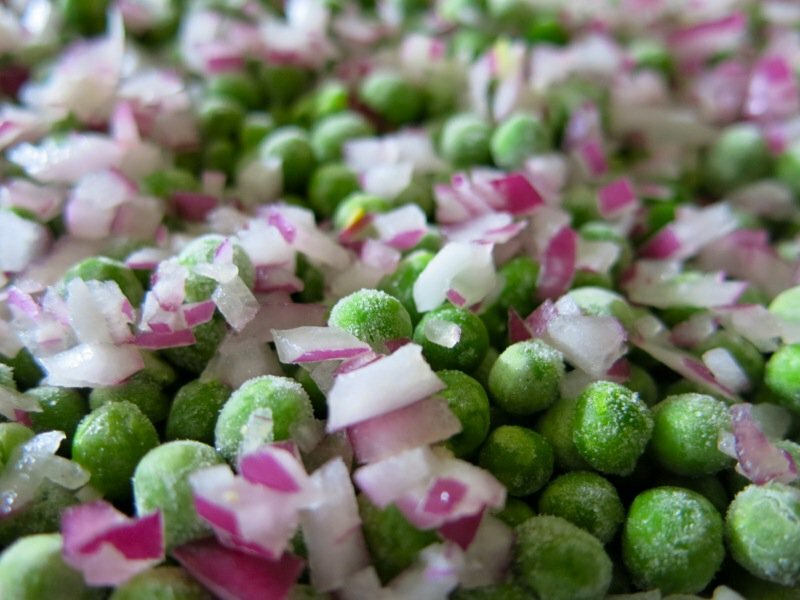 The fozen peas are the secret as they melt, the liquid is taken in by the lettuce and the onions. 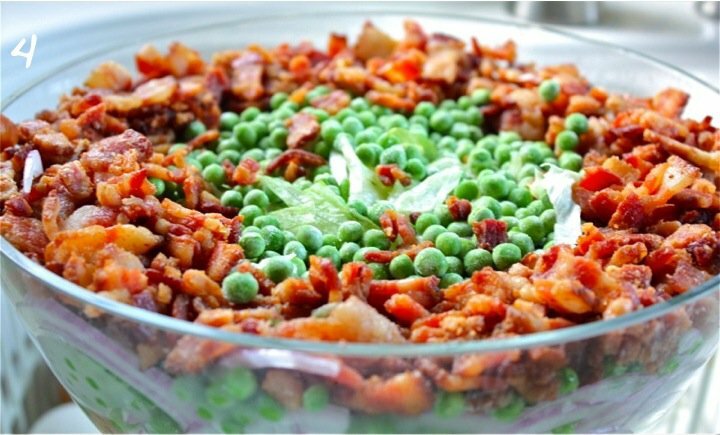 The crisp, cold lettuce and onions coupled by the plump juicy peas serve as the perfect counterpoint for the bacon, eggs and cheese. 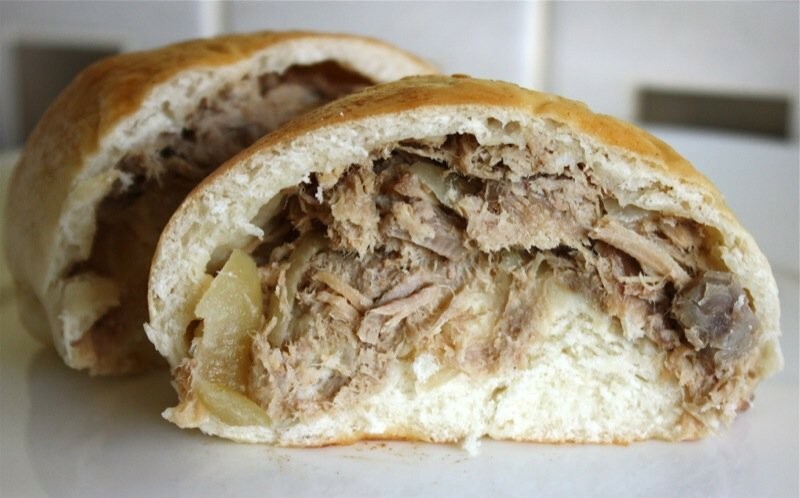 Those three unctuous little ditties with their varying textures really make this a bite that commands a good amount of healthy chewing. And when you are chewing your food, you know you are eating real food. 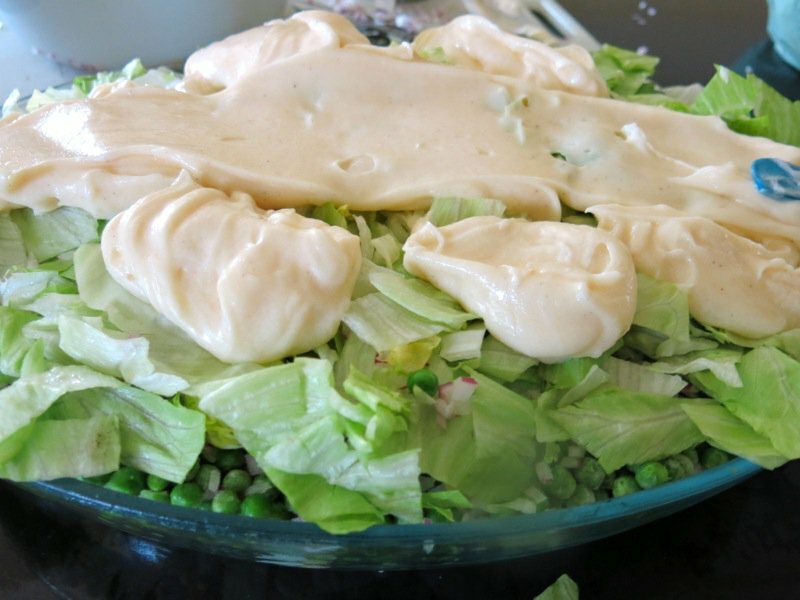 The amount of mayonnaise in this salad is generous as it does take a considerable amount to “ice” the lettuce…. 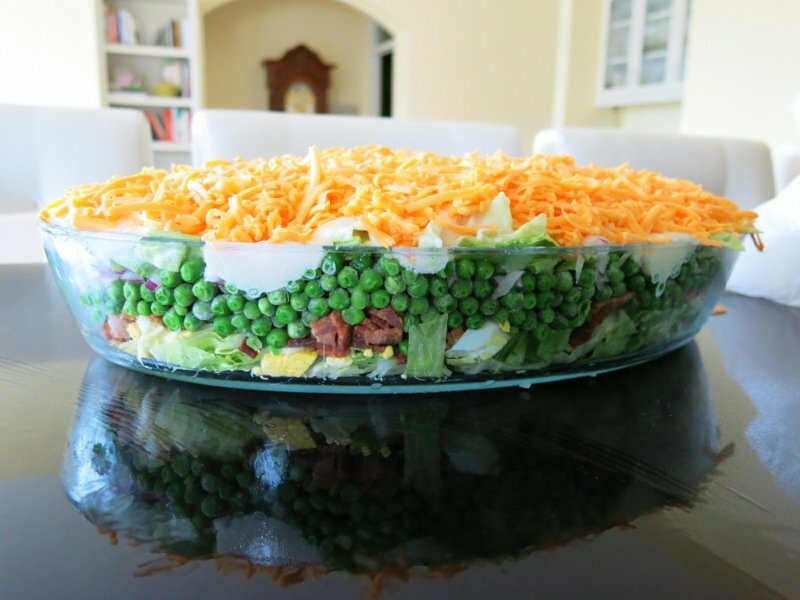 but, as this is a layered salad, push it off if you don’t want to eat that much of it. And, if you do, mix it in to each hearty bite. Hard boiling the eggs softly is really key, as is the acquisition beautiful farm fresh, free range chicken eggs. Look at those gorgeous yolks. 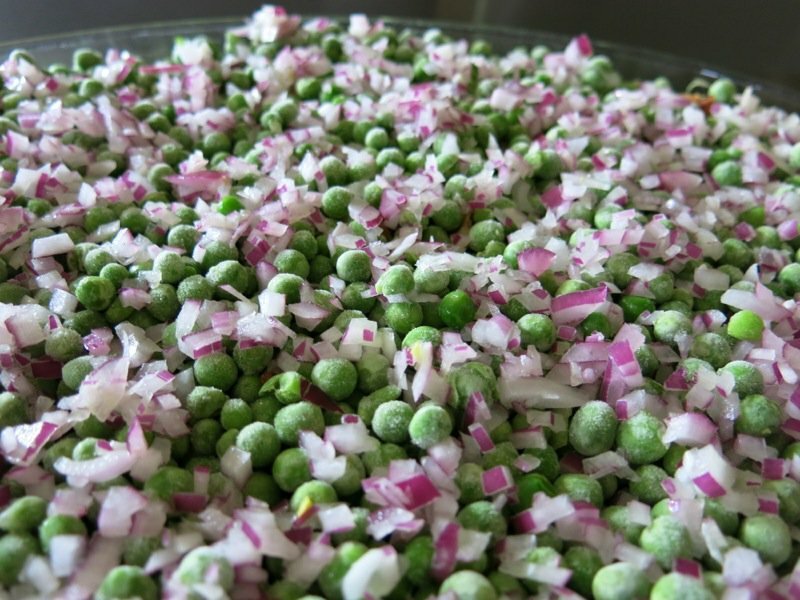 With anything I make, the quality of each ingredient is key. I don’t buy cheap streaky, thin limp bacon. I buy mine from my farmer, thick and substantial, cut it into lardons and fry it they way I like it. 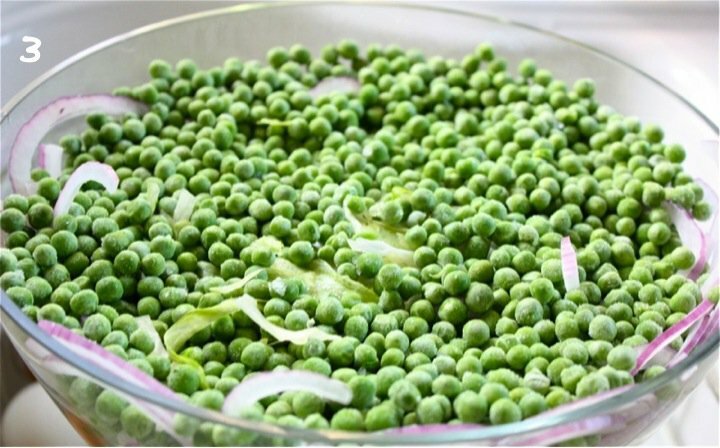 Confession: the peas should really go on top of the lettuce, and then the onions, followed by the rest… as you don’t want them to “melt into the eggs”. I just add enough sugar to the mayo to my taste preference, and slather it on. I dollop it first, or the lettuce tends to lift and stick to it. Dolloping avoids a mess. I know. I know. This is not looking very smanshy-fancy. It just isn’t that kind of a dish. No airs. No special graces. What you see is what you get. But it is really good. Why else do you think this recipe is still making her rounds? 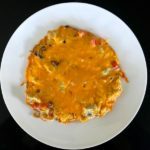 In the end, the only kinds of recipes that live a long and healthy life have to taste really, really good. And, she does. 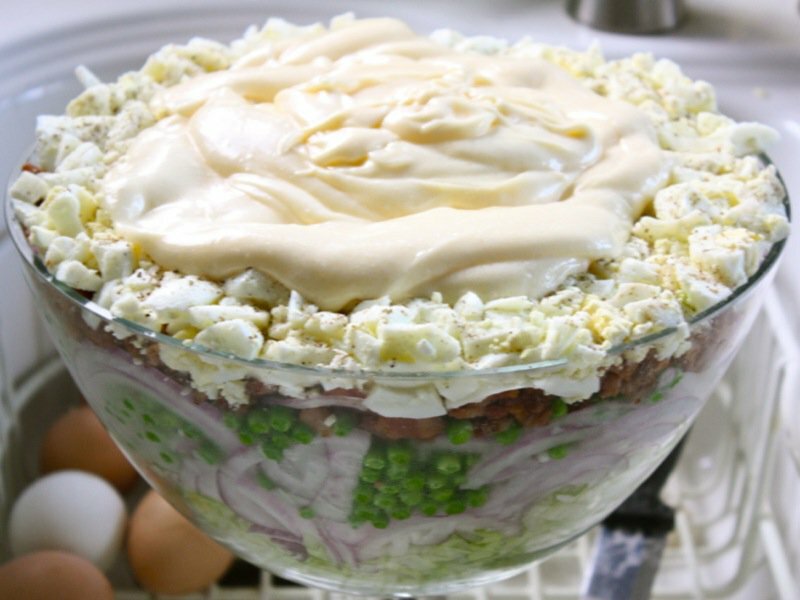 And just before the recipe, here is the version in a pedestal bowl and you will see the layers were placed in the correct order. 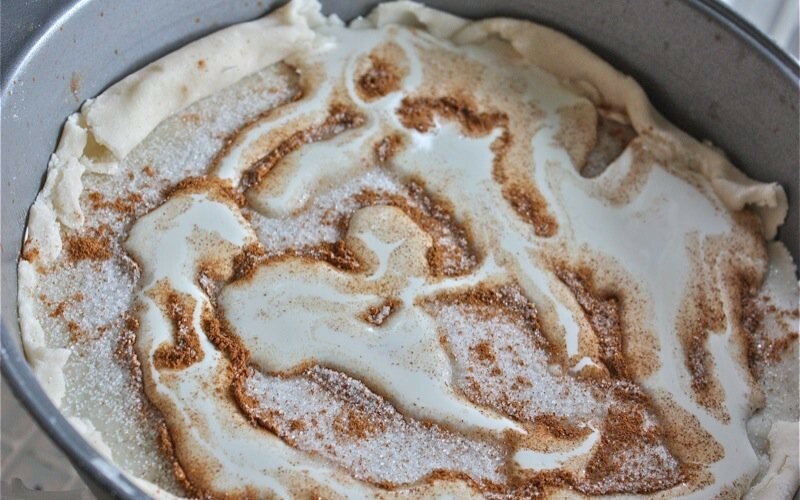 To get the biggest visual bang for your buck (never use clichés in writing), line the ingredients around the edge of the bowl for visual appeal. 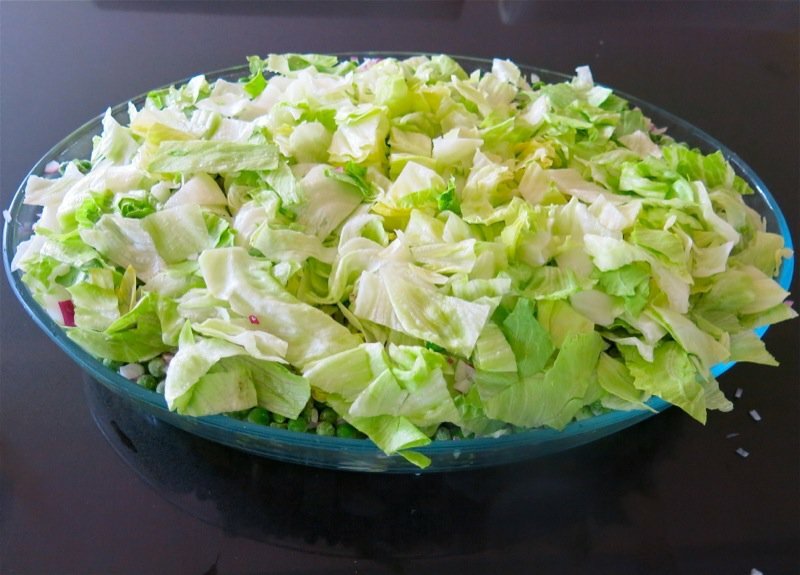 You will see I didn’t top this version with the remaining half of the lettuce, and that is because this gorgeous little number will need to be tossed in another bowl and served back in the clean pedestal bowl for service. There is no other way that each of the layers can be accessed in a pedestal presentation. 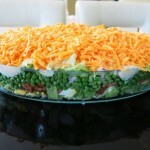 And it can be an 8 layer salad! Yes, it can! It can be whatever you want it to be! But, don’t make enough for leftovers. 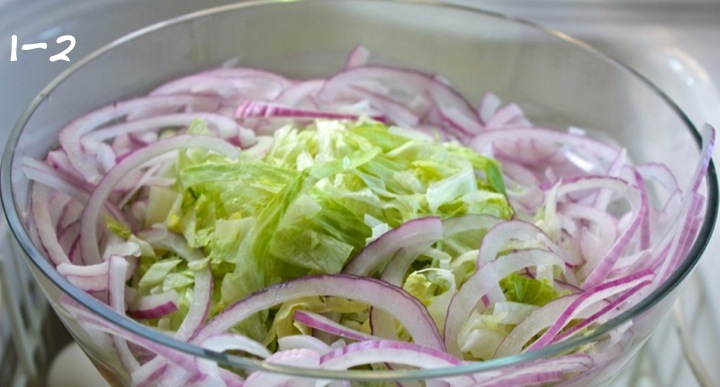 A 24 hour make ahead salad that is a full meal in a bowl. 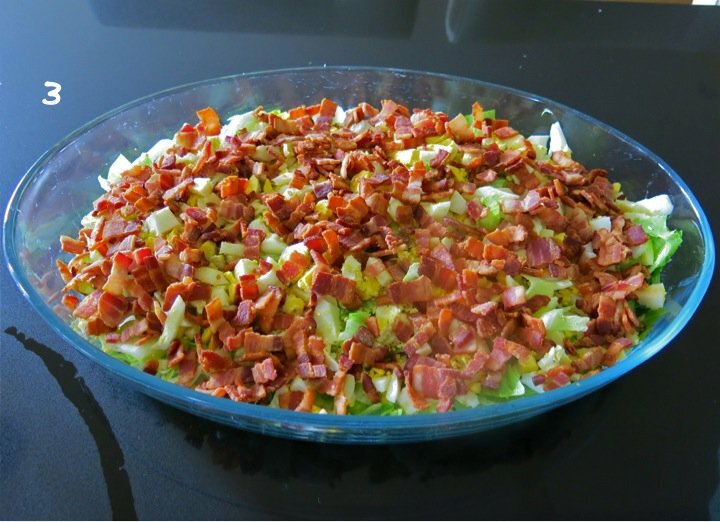 I almost always make a double batch for parties as this is a salad everyone loves. The ones in the photos are doubled. 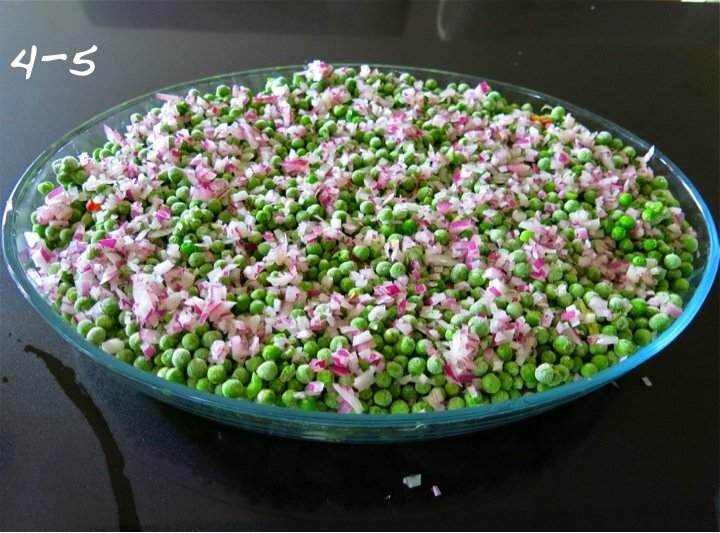 This is an absolutely delicious salad!! I’ve had it but never made it and am glad to see the explanation of the ingredients. Great! And now, between painting your gorgeous art work and living in the beautiful countryside, you can now make it. 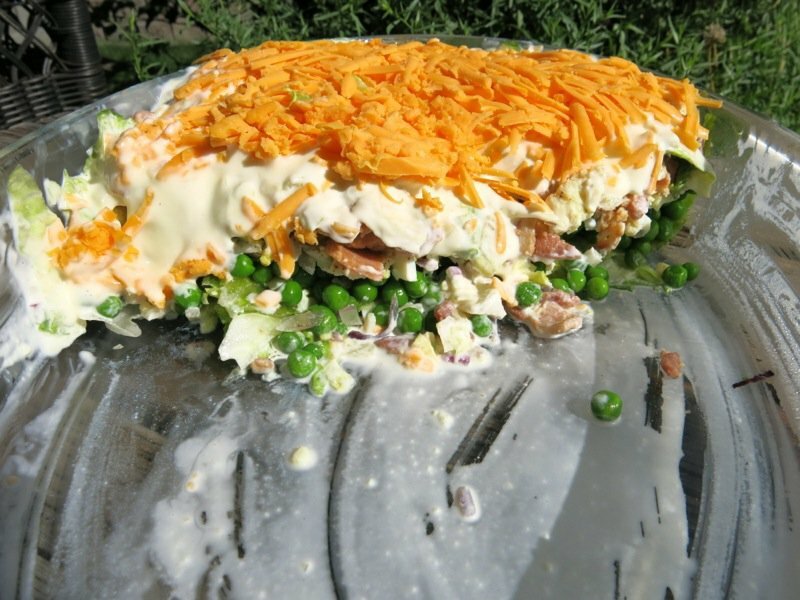 I certainly do remember a seven layer salad. 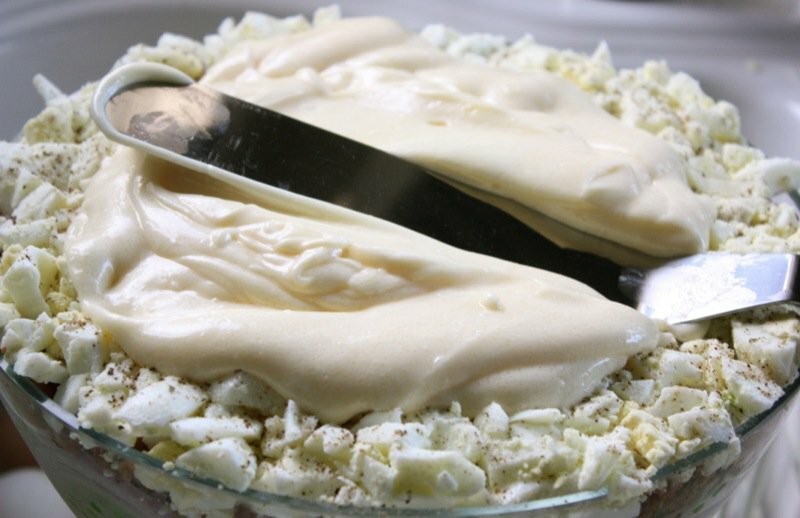 I remember one from the Silver Palate Cookbook from the 80’s that has a tonnata dressing. Now that one, I have never heard of. Will have to look it up! 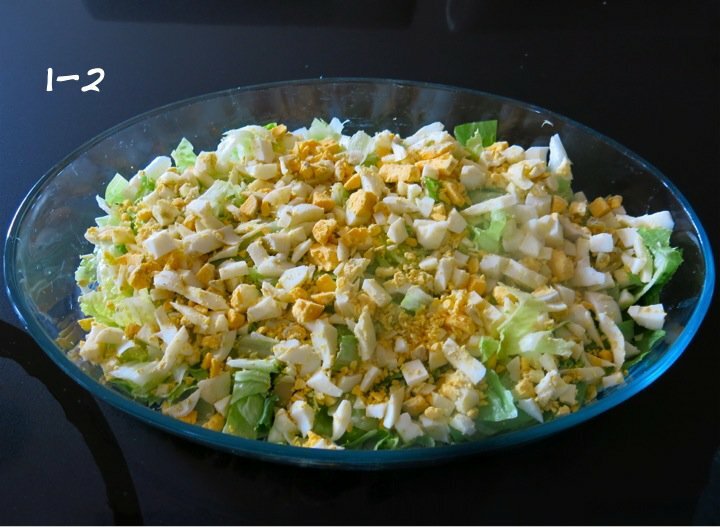 Absolutely I remember this salad! I made it from about 1975 to 1985 whenever I entertained or went to a potluck. There was never any left over. 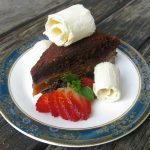 It is a retro recipe that deserves to live on. Isn’t it odd, though, Nancy, that everyone just “stopped” making it? I guess the “new latest” somethin’ somethin’ entered the scene and took her place. Oh yes, I absolutely remember this one. 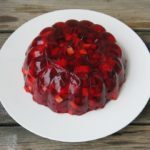 It made appearances at wedding and baby showers, housewarmings and potluck suppers all over town. You are tight – the key is in accessing all layers! Yours is beautiful and darn tempting. It is, in fact, more beautiful than I remember it. Thansk for resurrecting this retro delight! Thank YOU for stopping by, Adri! Where are you living – Canada/US? 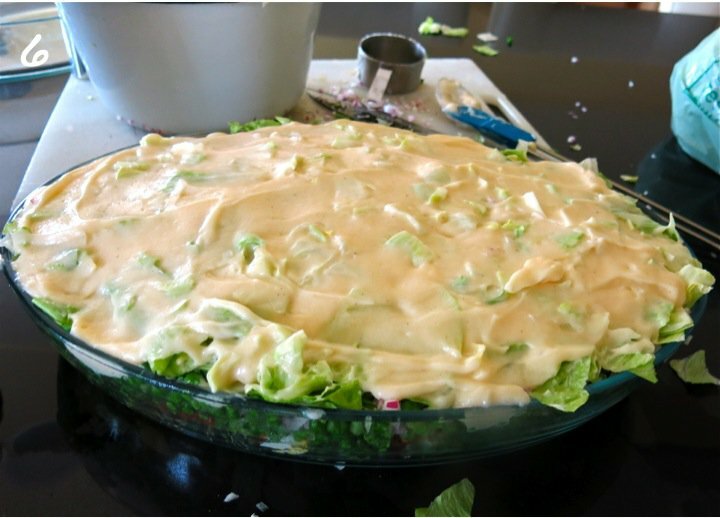 etc… I am curious about how far this salad spread in “those years”. Thanks for so beautifully showcasing a personal favorite! 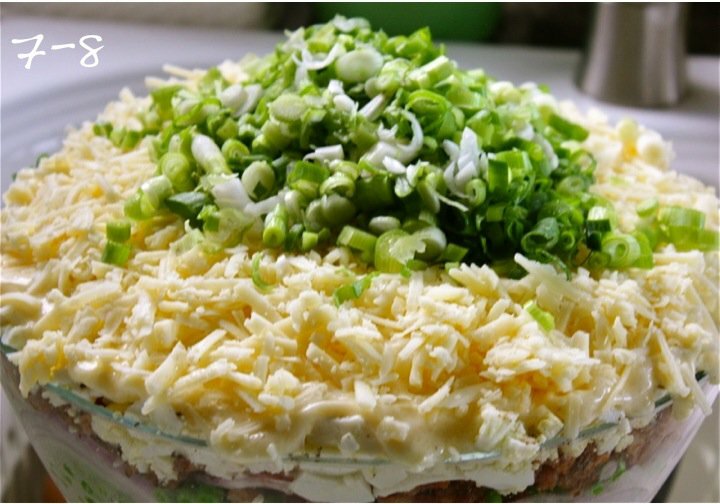 This is a great example of an old favorite that we should be bringing back to our potluck suppers. Which neck of the woods are you from… I am curious to see how far and wide this little recipe spread its wings, back in “the day”. I am originally from south-western Ontario near Windsor. This was definitely a favorite “back in the day”. Yum! This looks delicious. 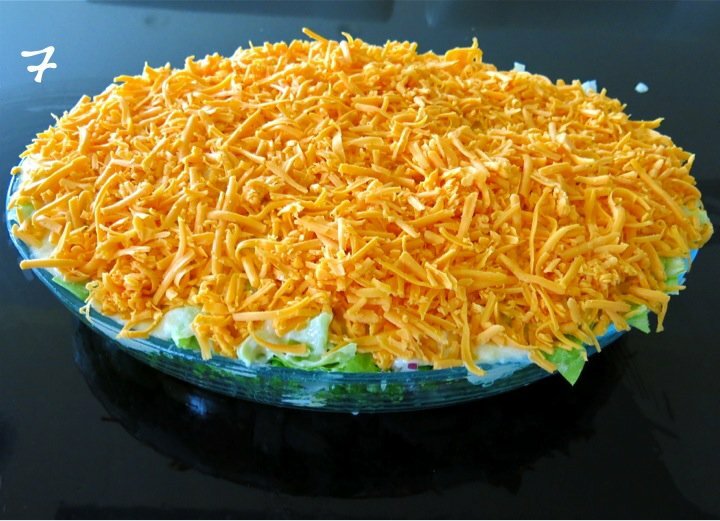 Bring the retro layer salad back! May as well eat as I dress! That salad looks so delicious, Valerie. I think it has great presentation. I’m from Manitoba – definitely had this a lot but never got tired of it. Making it for Christmas this year! 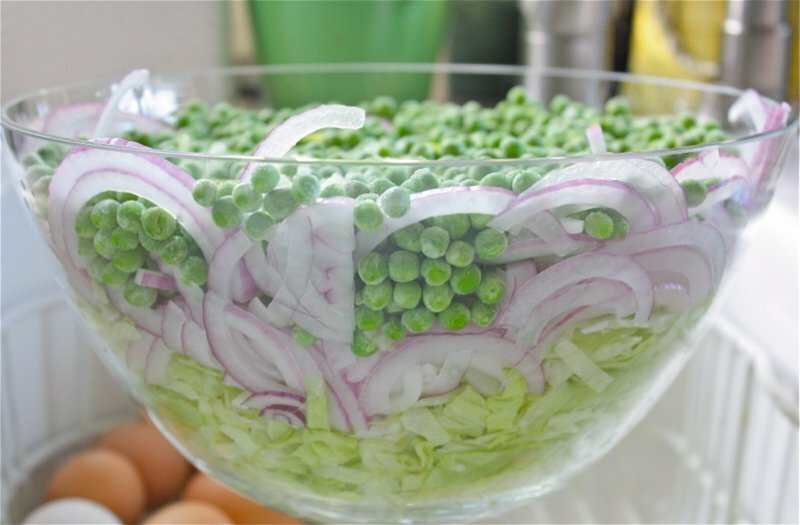 I have a large but lower clear casserole glass dish I will use. I recall using finely cut celery but maybe I’m remembering wrong. Delicious! Thanks for chiming in! You may have well remembered celery. I have had it so many different ways, but this is the classic way I had it most often. Whatever tastes good and works, right? That dish sounds perfect. 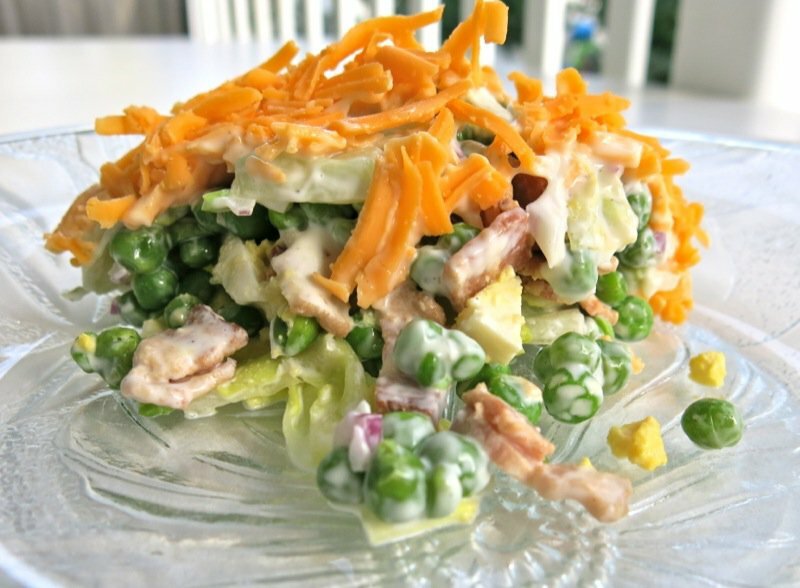 I recall this salad often being served in a pyrex casserole dish. 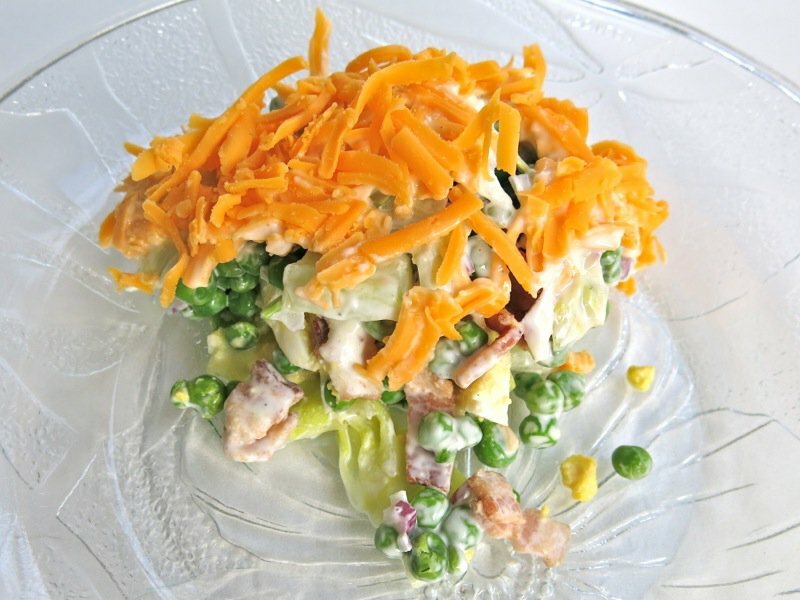 I remember this salad as a kid growing up in nowhere Ville farming community. It was at every pot luck at the hall. God how I miss those pot lucks at the hall! We decided to make if for Christmas dinner this year. Sooooo Good! Thrilled to hear you love it as much as we do. Sooooo goood. 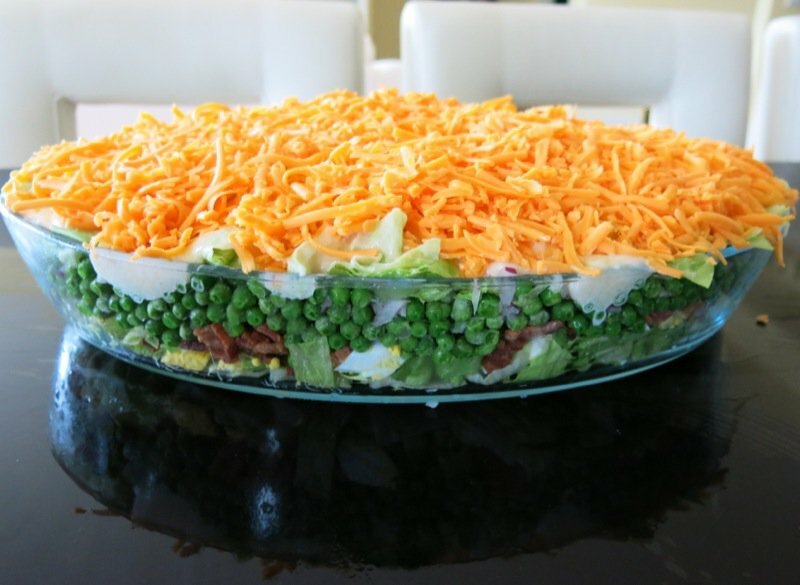 I had no idea this was a prairie thing – it was a staple in my world, but when I looked for a recipe no one seemed to have the same idea of what the “7 layer salad” was – I stumbled across your recipe and it’s exactly what I grew up with! Thanks for sharing it! Where is your world. It was definitely a prairie thing, but that doesn’t exclude it from finding a home elsewhere, either. That is usually what happens with recipes that people love. 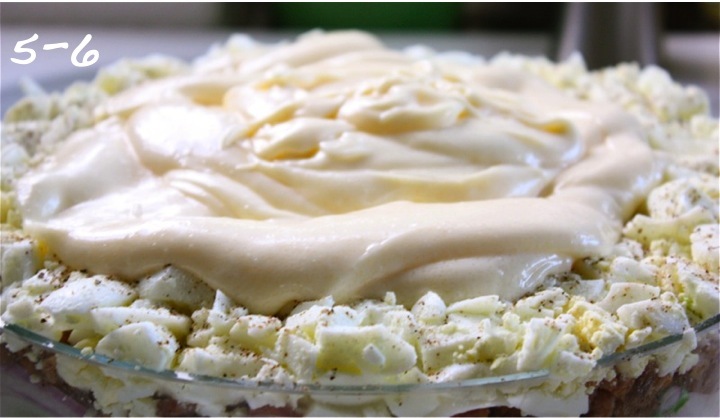 Think apple pie. 🙂 So thrilled you found it. Hope you enjoy it and making it once again brings you face to face with those lovely and innocent childhood memories. Wanted to send you a pic of this amazing salad from cover of Christmas 1980 Canadian living mag, I’ve been making this since then. My son loved it when he was a ten year old and at 47, it’s still a fave . 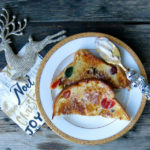 Thanks for sharing this wonderful recipe for a new generation of cooks .???????? Thanks Pat! I would love the image. I will send you an email! Thrilled to hear that Bonita!